We are only a mirror for the love we receive. On February 17th, we will feel Venus-Neptune sextile — with Venus in Capricorn and Neptune in Pisces — which will not only have an effect on our Valentine’s Day plans, but is going to impact our relationships for the remainder of the month. And for our zodiac signs and their love horoscopes, this spells out big news. Venus is the planet that governs love, beauty and even finances, so when we experience any sort of sextile, we’re going to see the rewards of our efforts or those areas where we need to dig in a little deeper to get what we hope to receive. In astrology, a sextile is when two planets are within 60 degrees of one another and work together to create the best possible scenario in whatever capacity they have been influencing us. In this case, it’s going to be concerning love. Have we have put in the work outside and within ourselves to manifest what we say we want? While this is a one-day transit, because of the nature of the energy, it’s likely we will feel this for the remainder of the month. It’s 2019 and no one wants to sacrifice or compromise on what they want — not necessarily because they can’t or won’t once in a relationship, but too many years passed. We all bartered and traded what we wanted for what we were offered, and now we’ve finally reached that point of never again. It’s been a hard-earned lesson, one that we have to continually remind ourselves of so we don’t slip backwards or forget that if we don’t put our worth or value first, we also won’t receive what we want. When we live with our values at the core of every choice we make, we invite a different scenario into our lives, especially when it comes to love. In this transit, we have Venus in Capricorn, and while she’s seen as unromantic during this time, it’s because she’s more concerned about the roots or foundation of the relationship. Venus rules our hearts and our pocketbooks; she wants everyone to be sitting around in love and happiness, but in different signs she becomes more focused on certain areas over others. Right now she’s looking to see if we’ve done the work on ourselves and our lives to have what we say we want match up with the space we have created. This theme is also highlighted around this time because of the overall nature of a sextile, which is that we will always reap what we sow. There have been numerous transits over the past few months that have asked us to look at ourselves, to change our lives from the inside out, and to master how we think and feel about ourselves before we can begin to make authentic choices about love, relationships, or commitment. If we’ve done the clearing and the work, this is the time we’ll likely see things start coming together. We’ll attract someone who sees us in the way that we see ourselves. We will be offered that new job that will enable us to live how we want, and we will understand that living the life we’ve always dreamed of first begins with ourselves. The second big influencer of this sextile is Neptune in Pisces. Neptune is the planet that governs our dreams, our sense of spirituality, and the beautiful way in which we picture or think about our lives. Pisces is the sign that rules unconditional love and has a deep connectedness to source and intuition. We’re being urged to pay attention to what we feel, what we experience, and any deep thoughts that break through the surface of our consciousness. Together, Venus and Neptune are going to shed light on if we have done our work and, if not, they will gently remind us to. This is a sextile, so it’s only positive and shows us the work we have yet to do. This aspect is really about something greater, and that’s also just the ability to enjoy love; to sit back and be happy with what we have, to feel inspired, full, and have the knowledge that there isn’t anywhere else we’d rather be. 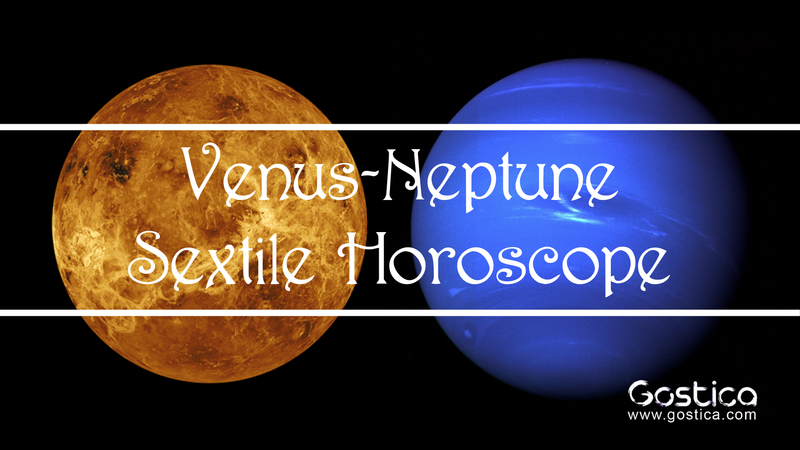 Venus and Neptune can make relationships have that ultra-hazy romantic vibe, almost like maybe it’s so good it can’t be real. It’s the kind of love that makes those simple moments we remember forever when we come home to a trail of flowers leading to a simple floor picnic for two. Or, maybe being woken up in the middle of the night just to see the moon. It’s this very dreamy, surreal, almost fairytale-like feeling that will remind us exactly why we have done all the work that we have. This transit is a sweet reminder from the universe as to why we are working so hard. Yet regardless of the specifics, it’s clear that this transit really represents a shift and a moment when we veer away from the suffering of the past, the beliefs that kept us frozen in place. It’s time to let ourselves move forward — physically, mentally and emotionally. When we’re speaking about really embracing this Venus energy, it also means we have to see that our relationships with others will only ever mirror the one that we have with ourselves. Venus wants to wake us up to the love that we have within, the belief that we hold about our worth, and what we deserve. It’s not just in terms of a relationship but in how we carry ourselves — the thoughts we believe and the expectations that we have for how others will treat us. Because while we are a mirror for others, others are also a mirror for us.